Bloomberg finally picked up the story discussed here a couple weeks back on the dying sovereign CDS market in the Eurozone. Bloomberg: - European Union rules to curb speculation on government debt are prompting an exodus from credit-default swaps, making it harder for investors to insure bonds and threatening to boost sovereign borrowing costs. Trading has dried up on the Markit iTraxx SovX Western Europe Index that was created in 2009 to help investors mitigate government credit risk following the worst financial crisis since the Great Depression. The volume of deals on the 14 nations now included in the measure fell 20 percent from last year’s peak to $108 billion, the lowest since April 2010, according to the Depository Trust & Clearing Corp [DTCC]. The European Commission, in its goal to decrease transparency into the health of European sovereigns, destroyed liquidity in this market. The extraordinarily naive view of the regulatory authorities of how this and other markets function is astounding and dangerous. Somehow they think that if one bank holds sovereign bonds, it will go to another bank and buy protection on those bonds. And if the bonds default the protection buyer will be compensated. That's silly. Both the buyer and the seller of protection will only enter into such agreement if there is an active two way market out there - they both need the ability to get out of this position at any time. The buyer for example may sell those bonds and will need the ability to sell the CDS as well. But the "naked short ban" killed one side of the market, taking out a big segment of protection buyers. The limited numbers of protection buyers simply took many participants out of the market altogether as liquidity risk made any participation dangerous. Indeed this effect is visible in the DTCC data (for those interested, here is the link - it is by no means easy to find). 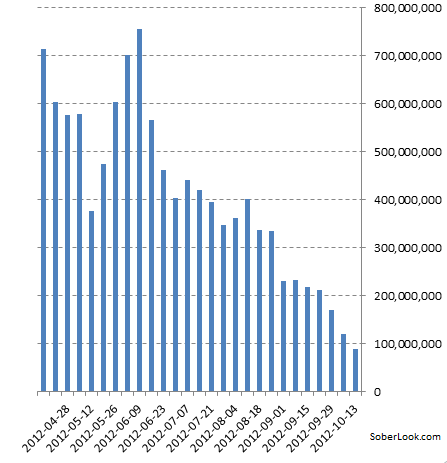 The Markit iTraxx SovX Western Europe - Series 7 (the latest contract) volumes have collapsed. Below is the 4-week moving average volume of the volume over the life of the contract. In the first week of trading for SovXWE-7 about a billion worth of contracts traded. A week ago 40 million traded. What's disturbing about this development is that without a liquid CDS market, lenders and investors may choose to stay away from certain countries or markets because they will have a limited ability to protect themselves. CDS is not insurance - most protection buyers don't wait for default to occur before monetizing their protection. When spreads widen, they need the ability to sell in order to take profits. The fact that the rules may allow them to buy protection is irrelevant when there is no liquid market out there. Congratulations EC - job well done.